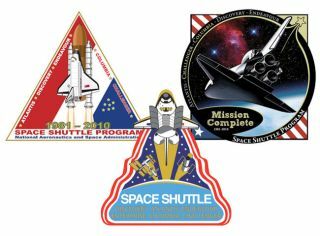 NASA has revealed the 15 patch designs that willcompete to become the agency's official commemorative emblem for the endof its space shuttle program later this year. "The emotion that has been put in to the designs shows tremendous commitment and loyalty tothe space shuttle program," wrote Debbie Byerly, who led thepatch contest as technical assistant to shuttle program manager JohnShannon, in an e-mail to all 85 pastand present NASA and contractor employees who entered. "Thejudges found it extremely difficult to narrow down the submissions to a 'Top15,' but they have completed that task." The judges, who included Shannon, his deputyLeroy Cain and three other shuttle program managers including formerastronaut John Casper, chose 15 mostly circular-in-shape designs thatdepict the spacetransportation system in its different stages of flight. Some of thefinalists also feature depictions of the International Space Station(ISS) and the Hubble Space Telescope as two of the shuttle's crowningachievements. The same panel of NASA judges will ultimatelyselect the winning artwork to be flown on STS-132, the final flight of spaceshuttle Atlantis as currently scheduled for launch in May. Beforethey make their selection though, NASA will give its workers a chance tovote for their favorite. "Voting will begin January 11 and end January29, 2010. The People's Choice voting will be one factor considered in theselection of the final patch," Byerly explained in her e-mail tothe entrants. Voting in the employee poll will be conductedthrough the internal NASA "Rendezvous" website. The artist behind the winning design will bepresented with the flown artwork as an award and see his/her patch beadapted to appear on NASA-produced decals and other outreach products. ThePeople's Choice winner, if different from the judges' favorite, willreceive a framed certificate, while all other contest participantswill receive an award to be specified later by the shuttle program. To avoid influencing the voting, the identities of theartists have been kept secret. Byerly told collectSPACE though that theentrants included workers from NASA facilities located nationwide and thattheir professions ranged from technician to astronaut. The contest did not require those whoentered to possess artistic talent as NASA's graphic artists would beavailable to work with the winner to adapt his/her idea for use bythe agency. The contest, which began lastOctober and closed to new submissions in December, was developed byShannon and Byerly to be an "uplifting" activity forshuttle workers as the program entered its final year. Five shuttleflights remain on NASA's manifest starting with the launchof Endeavour on the STS-130 mission in February. Should all proceedas is currently scheduled, Discovery will fly the program's final flight,STS-133, in September. According to Byerly, the winning patch will beannounced by NASA sometime in February. See the "Top 15" patch designs at collectSPACE.com and return on Jan. 11through Jan. 29 to take part in collectSPACE's unofficial fan poll for the topdesign.